Caroline Lockhart was a journalist, bestselling Western author, rodeo founder, homesteader, and cattle queen. 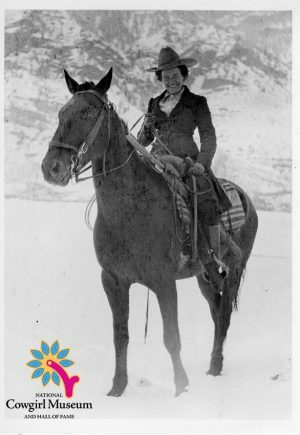 Her lifelong quest was to live the life of a cowgirl: independent, on horseback, in the beautiful, open country of the West. Raised by a Kansas cattle trader, Lockhart proved a talented horsewoman. Born in 1871 with an adventurous spirit, little fear, and a sharp sense of humor, she once wrote that she’d been “born on a horse.” At sixteen, she attended boarding schools, first Bethany College in Topeka and then the Moravian Seminary in Bethlehem, Pennsylvania. Two years later, she decided she would become, “The Nellie Bly of Boston,” applying for a job at the Boston Post. As the first female reporter for the paper, she took wild and dangerous assignments, such as being the first woman to dive in a deep diving suit into Boston harbor and jumping out a fourth floor window to test the fire department’s safety nets. She also provided exposés and profiles on many citizens, from politicians and debutantes to prizefighters and female artists. At 24, she profiled Buffalo Bill Cody and a number of his men, greatly admiring the West that they represented. By 1904, she was working in Montana, on assignment for the Philadelphia Bulletin, to write on the Blackfoot Indians. She passed through Cody, Wyoming and found it to be the American West she had always felt sentimental about, and she moved there in order to live the life. In the 1900s and 1910s, she became friends with Buffalo Bill and a number of “real” Westerners. She went on multi-day horse packing trips to places like Wyoming’s Hole-in-the-Wall, home of Butch Cassidy’s Wild Bunch, potentially dangerous destinations for a woman alone. She translated her local nonfiction success to a career as a nationally bestselling novelist, often utilizing her adventures and the local citizens of Cody as her subjects, at times controversially. Three of her books were turned into movies. Lockhart presented an alternative path for the romantic novel of the West: she had stronger female characters, more humor, and a more vivid sense of place. In 1920, she returned to journalism when she purchased the Cody Enterprise newspaper, originally founded by Buffalo Bill. Her journalism, exploring issues such as Prohibition, was as vibrant as her fiction. Simultaneously, Lockhart co-founded the Cody Stampede rodeo, serving as the first board president and the only female to hold the position. Today the Stampede is one of the world’s most significant events in rodeo. After Buffalo Bill’s death in 1917, it was Lockhart who insisted that the town honor him. She convinced Gertrude Vanderbilt Whitney to raise funds for and to sculpt the statue that is now the centerpiece of the Buffalo Bill Center of the West museum at the heart of Cody. This campaign did much to solidify the showman’s posthumous reputation back East. Caroline Lockhart still yearned to live authentically in the West, not just honor it. So at age 55, she retreated from Cody to homestead the L Slash Heart Ranch in the southeast reaches of Montana’s Pryor Mountains. It was an incredibly hard place to run cattle. Starting with 160 acres, she gradually expanded to over 6,000 acres through purchases and leases. In 1936, three loads of Lockhart steers topped the market in Omaha. Despite her literary, organizational, business, and civic successes, she saw this accomplishment as a highlight in her life, becoming a cattle queen. Although she had many suitors throughout her life, Lockhart never married; she remained independent to the end. She died in 1962.